The Deal – If you are currently an Amazon Prime Member or if you sign up for Amazon Prime over the next two days, then you can get the new UK version of the Amazon Prime TV Stick for just £19 instead of the usual £35. If this seems like a good deal to you, then you can grab your Fire TV Stick here*. It is no secret that I’m a fan of Amazon Prime. I wrote an Amazon Prime UK Review post not too long ago and I’ve continued to enjoy the benefits of the service ever since then, making good use of both the One Day Free Delivery and also Amazon Instant Video. One thing that has bugged me for a while however is that I’ve been watching the Amazon Instant Video service through my PS3, as the TV in our living room isn’t Smart enabled. This was leading me towards purchasing the Amazon Fire TV box. 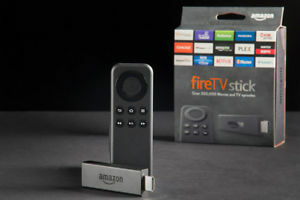 When doing a little research online however, I discovered that in the US they have a cheaper version of this product, namely the ‘Amazon Fire TV Stick’ but – until today – it was not available in the UK. To me this product seemed not only to be cheaper but also to be so much more convenient, as you don’t have to add yet another box to your TV unit. Another benefit of the new Amazon Fire TV stick is that like the Fire, it also has the Amazon Music App available on it, so if you store your music on the Amazon cloud then you can play it through your TV and this appealed to me specifically. As I mentioned earlier, until today there was no firm release date for the Amazon Fire TV stick in the UK. A couple of weeks ago though, I noticed that the price of the normal Amazon Fire TV Box had been slashed by Amazon from the usual £79 down to £64, which led me to believe that the UK release of the Fire TV Stick may be just around the corner, so I held off buying for a few weeks to see if I was right. It turns out that I was and I received an email today from Amazon stating that for two days only, they would be offering Prime Members the Fire TV stick for just £19 – a move which I’d also been expecting because I’d read online that they had done the exact same thing when they released the stick in the US. You don’t get a voice controlled remote with it at this price but you do get a standard remote with the option to buy a voice controlled one separately if you really want one. Personally I’m not that fussed and the standard one will do me just fine. I’m hoping that the stick is as good as I hope it will be and I’ll be sure let you know my thoughts on it once I’ve used it for a while. Update – The 2 day £19 deal for prime members has now ended but you can still pick up the Amazon Fire TV stick for £35. Do you use the Amazon Prime service or is it a waste of money in your eyes? Longing For The Days Of Old Style Banking! 2 Responses to Get almost 50% off the New Amazon Fire TV Stick – 2 Days Only! I think that Amazon Fire TV Stick is such a great purchased! I’m not yet a member of Amazon Prime and I would love to sign up. I am loving all of the new TV streaming technology that is coming out. With more and more options, sooner or later cable TV is going to start losing subscribers – enough that it will have to address the prices they charge.